NEW YORK — The NFL meetings concluded Wednesday without resolution on the divisive issue of players protesting during the national anthem to shine a light on racial injustice, but commissioner Roger Goodell again signaled that a plan is forthcoming while sidestepping President Donald Trump’s latest Twitter attack on the league. 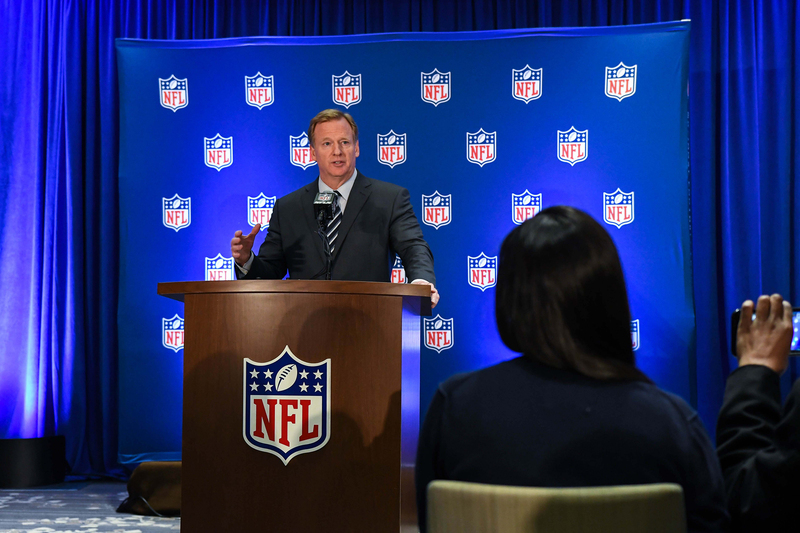 For the second time in as many days, Goodell walked a tightrope while addressing reporters here, both praising activist-players for their passion in pursing social change and reaffirming the league’s commitment to honoring the U.S. flag and the anthem. Although owners did not pursue rule changes that would have mandated that players stand during the song, they articulated their strong preference for the demonstrations to cease. Meanwhile, the nation’s highest elected official continued to make Goodell’s job more difficult. In an early morning tweet Wednesday, Trump resumed his criticism of professional sports’ most powerful league. If the NFL cares about Latino fans, why hasn't it taken a stand on DACA? Goodell didn’t take the bait. 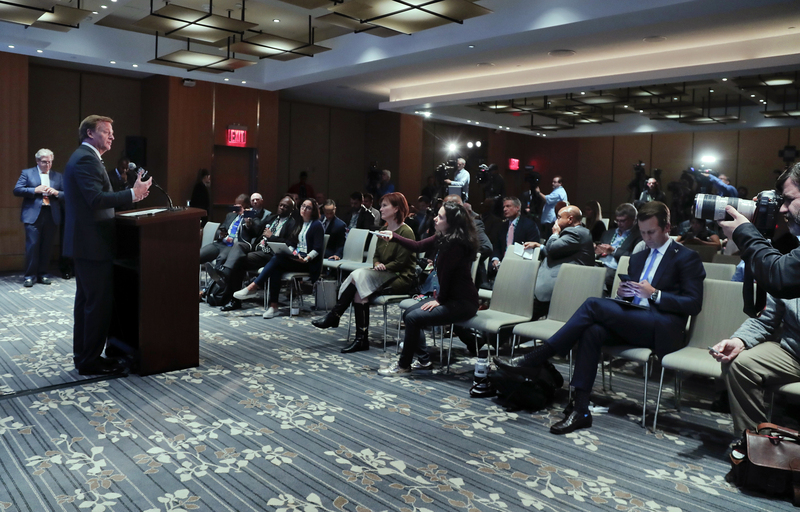 NFL commissioner Roger Goodell speaks during a news conference Oct. 18 in New York. Trump’s Twitter storm against NFL and NBA players late last month actually breathed new life into the protests. In leaguewide defiance of the president during Week 3, players on almost every team took a knee. Owners, coaches, team executives and support staff also joined them, participating in various exhibitions of team unity. But for owners, that was a one-week deal. Growing concern among owners about fan backlash against the protests recently prompted the Dallas Cowboys and Miami Dolphins to instruct their players to stand. Cowboys owner Jerry Jones, as he often does, took things to a higher level, vowing to bench any player who protests. Putting aside the fact that the league, under its rules, has no authority to discipline players for protesting, it would also be against U.S. labor law to require players to stand for the anthem. The billionaires whom Goodell serves could have attempted to push through new rules regarding the anthem. And they would have undoubtedly triggered a fierce battle with the NFL Players Association. For Goodell, trying to force players to stand for the anthem wasn’t a hill worth dying on. In his calculation, the optics would be much better if owners work with players in an effort to help bridge the nation’s racial divide. NFL commissioner Roger Goodell speaks to the media after the NFL owners meeting at the Conrad Hotel. Players are most interested in criminal justice reform, education reform and improving the relationship between the African-American community and law enforcement. Those are issues Goodell figures he can persuade his bosses to back. Activist-players are optimistic that the league will soon unveil a multipronged proposal to truly support them. The dialogue between the league and players, which began shortly after former San Francisco 49ers quarterback Colin Kaepernick first sat and then kneeled in 2016, is ongoing. Another formal meeting is expected to occur within two weeks, Goodell said. It wouldn’t be surprising if owners present a proposal to players during the next rap session. Of course, no matter what the league does, it won’t end the nation’s problems associated with centuries of institutional racism. The league could, however, take on a bigger role in confronting policing issues, according to Rep. Cedric L. Richmond (D-Louisiana). In a recent letter to the NFL, the chairman of the Congressional Black Caucus wrote about the patriotism that activist-players have demonstrated in protesting, partly, against police brutality. “I’m disappointed that the league hasn’t focused much more on this,” Richmond said on the phone. “My letter was trying to highlight to the owners that this is a big issue. When players leave the practice facility or the game and they’re dressed in [street] clothes, they feel what other African-Americans feel. And they have eyes. They see the misconduct [of some officers].